On October 16 over 200 CEOs, politicians, academics and community and business leaders gathered in San Jose to tackle the issue of foreign oil dependence from a business perspective. Hosted by Novellus Systems and the Silicon Valley Leadership Group the meeting aimed to brainstorm for ways businesses can lend their hand to the effort to reduce our dependence on oil. "Any small disturbance in the flow of oil in the form of a terrorist act could disturb the oil flow in the world and have a major impact on the economy in the world in the form of a recession," explained the leader of the initiative Sass Somekh President of Novellus Systems who is also an IAGS Trustee. Sen. Dianne Feinstein, a member of the Senate Appropriations and the Energy and Natural Resources committees was the keynote speaker. Among the other speakers were Congresswoman Zoe Lofgren, Congressman Mike Honda, California Undersecretary for Energy Affairs Joe Desmond, Palm President and CEO Ed Colligan, Synopsys CEO Aart de Geus, and Set America Free Coalition members Bud McFarlane and Anne Korin. 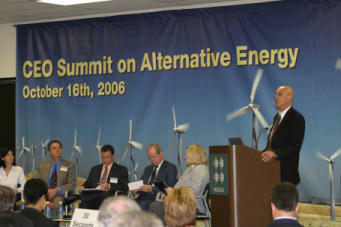 In the end of the meeting 85 organizations affirmed their intent to act on the topic of alternative energy and signed a pledge which says: "We, the business and policy leaders of Silicon Valley and California, agree that our nation's dependence on foreign oil is a threat to our economy and our national security. We recognize the link between energy, security, environmental health, and economic growth. We commit to action to reduce the dependency on oil and promote alternative energy technologies. We believe that by working together as business leaders and policy makers we can make an impact." The signatories committed to support policies such as reduction of oil consumption by at least 2.5 million barrels a day within 10 years, providing incentives to enable consumers to use alternative energy sources for transportation and ensuring that most cars sold in the U.S. will be flexible fuel vehicles. They also committed to take action in their organizations to decrease energy consumption by supporting alternative commuting and telecommuting programs and shifting their fleets to alternatively fueled and efficient vehicles. The group pledged to reconvene next year to measure results. Set America Free applauds the business leaders who took part in the event and calls on all the CEOs of America to embark on similar efforts. Gal Luft in the Baltimore Sun: "America's ability to accomplish its main foreign policy goals - winning the global war on terrorism, spreading freedom and democracy around the globe and preventing the proliferation of nuclear weapons - will be compromised as long as we are dependent on oil to the degree that we are today. "[...] Winning the war on radical Islam at current oil prices is an oxymoron. Unlike World War II and the Cold War, in which America's strategy was to deny the other side the economic wherewithal necessary to keep up the fight, in the current war, the U.S. is doing the exact opposite. While the U.S. economy hemorrhages nearly $300 billion a year to pay for imported crude, oil-producing nations such as Saudi Arabia and Iran that are sympathetic to - and directly supportive of - radical Islam are on the receiving end of staggering windfalls. In 2005, OPEC's net export revenues were $473 billion, more than double the amount generated in 2001. This year, the figure is likely to surpass half a trillion dollars. An undetermined portion of that money finds its way - through official and unofficial government handouts, charities and well-connected businesses - to the jihadists committed to America's destruction. "[...] In order for us to regain control over our foreign policy, reduce our vulnerability to supply disruptions and curb the flow of petrodollars to unfriendly regimes, a new and central objective should be added to our foreign policy: leading the world on an accelerated shift, enabled by modern technology, toward a global transportation system based on next-generation, nonpetroleum fuels and the cars and trucks that can run on them. "Only through a balanced domestic and international energy policy that encourages investment and innovation in alternative energy and energy efficiency will we be able to gradually reduce global oil prices and increase the chance of accomplishing our foreign policy objectives. Domestically, the U.S. should require that most new vehicles be flexibly fueled with gasoline-ethanol-methanol, a feature that adds less than $150 to the cost of a new car and opens the market to alternative fuel producers. The U.S. should also remove the protectionist 54-cents-a-gallon tariff on imported ethanol - particularly absurd because we do not tax oil imports." A more extensive article on the subject by Gal Luft and Anne Korin was featured in The American Interest. Where do you stand on requiring that most new vehicles sold in the U.S. be flexible fueled vehicles, a feature that adds less than $150 to the cost of a car and enables fuel choice? Where do you stand on removing the 54 cent a gallon tariff on ethanol imports? Where do you stand on incentives for consumer purchase of advanced and efficient vehicles? Where do you stand on setting a goal for oil savings backed up with policies that can achieve that goal? If you hear a politician assert that alternative sources of electricity such as nuclear, solar, or wind can reduce our dependence on oil, remind them that unlike in the 1970s, today only 2% of U.S. electricity is generated from oil, and that most of our oil is consumed in the transportation sector - a good reason to encourage plug-in hybrid electric vehicles. If you hear a politican blame the situation on "big oil", remind them that today only 6% of the world's oil reserves are controlled by international oil companies such as Exxon, BP, Chevron, or Shell. Most are controlled by national oil companies, which means by foreign governments, which often forbid access to their reserves. For example, Saudi Aramco alone controls 25% of the world's oil reserves. So beating up on big oil is a way to tap into populist sentiment without actually doing anything to solve the problem - that is, it's a way to avoid talking about real action such as the measures described above. Are your Representatives on board? You can check if your elected officials are putting their votes where their words are by asking if they are cosponsors of the Vehicle and Fuel Choices for American Security Act (S.2025 in the Senate and HR.4409 in the House - you can check who is on board by clicking here), or if they plan to become cosponsors when Congress reconvenes. Click here for a Congressional directory. Order your Set America Free t-shirt today! If you'd rather send a check, please click here for instructions. Missed a Set America Free update? Catch up here. THE SET AMERICA FREE COALITION brings together prominent individuals and non-profit organizations concerned about the security and economic implications of America's growing dependence on foreign oil. The coalition, organized by the Institute for the Analysis of Global Security (IAGS), promotes a blueprint which spells out practical ways in which real progress toward energy security can be made over the next several years. To get Set America Free updates by email click here.